We take great pride in offering only the best treatments available. Not only will your experience be like no other, you will see results to match. An Aroma-Works express ritual, pressure point scalp massage and an express Frothimoon Bespoke Facial. One and a half hours of pure bliss! Commences with an Aroma-Works express ritual; a classic Back Neck and Shoulder massage to help relieve specific areas of tension, followed by a For Men Energy Facial. Infused with a blend of plant extracts and Vitamin C, this facial therapy is not only relaxing but also rejuvenates the skin often irritated by the daily ritual of shaving. 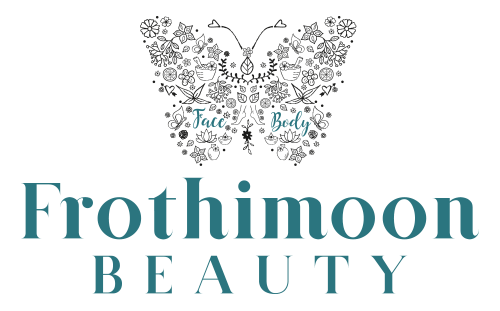 Let’s begin with painting the fingers and toes, finishing with an express Frothimoon Bespoke Facial. Commences with our luxury foot cleanse followed by our relaxing warm Pinda Stone Massage around the body before a gentle exfoliation of legs, arms and bump with a body wax rich in Vitamin C.
Continue to relax with a mini Frothimoon Bespoke Facial whilst a cooling and revitalising Vitamin C wrap is applied to the stomach restoring elasticity and hydrating. Finished with a minty leg gel creating an incredible feeling of lightness. With essentials for your wedding day that continues for your Honeymooning! An Eye-brow, Half Leg, Underarm and High Bikini Wax followed by a Shellac application to the hands and toe nails.